The Lost Alphars series is set in a world where shifters are the ruling power. They are led by Alphars, the strongest shifters that can change into any creature they want. It has been centuries since an Alphar was born and now there are territories that no longer have an Alphar to lead them. 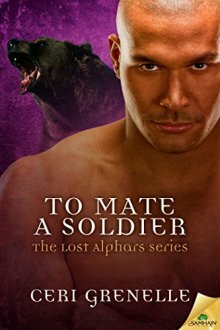 The Alphars are dying out and shifter society is falling into disarray. But through the chaos and excitement the bond of mating between those who love holds strong, for it is only love and loyalty that can withstand the coming storm. Lottie Braddock has let everyone believe she’s a widow wasting away from mate sickness. In reality, she struck a devil’s bargain to conceal her young son’s true identity—a protection spell that feeds on her life force. She plans to take one secret regret to her grave—until that regret crashes through her clinic door with one of her children in the throes of a premature shift. Desperate for more time, she sets out to find that devil once again and plead for her life. Jeremiah Quinn, head soldier of the North American Weres, doesn’t take orders from anyone. But damned if he’s letting the ailing, fragile Lottie make this journey alone. He’s known for years she is his mate, and he’s through letting her push him away. Come hell or high Magic, he refuses to let her go without a fight. For her life. For her love. For the love of her sons. Even if saving her soul means sacrificing his own. Warning: Contains a healer who’s sacrificed all she has for her family and a steadfast soldier who isn’t afraid to prove he’s been a part of that family all along. I've always had an active imagination. An imagination that usually took form in the way of zoning out in the middle of conversations. I eventually decided it was time to share my daydreaming with the world and began to put my musings on paper. I am currently living it up in Northern California after a big move from New York City. And by living it up I mean staying home with my cats, obsessively watching episodes of my favorite TV shows, all of which are extremely geeky, and simultaneously reading the next book on my reading list. I do all this while trying not to pig out on unhealthy snacks. As you can tell, I lead a busy life.